It’s possible to live without us, but you are sure to feel more secure and comfortable with us! We enjoy more than 24 years of impeccable security services activity in Kiev and Ukraine. To organize effective civilian control, boundary and property protection are high priority measures for the owners of enterprises, offices, other premises and objects. Only well-trained and experienced personnel can guarantee security in such cases. 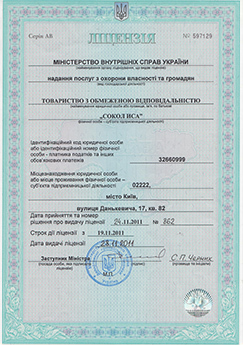 The Security Company “SOKOL” has been operating for more than 22 years in the Ukrainian security services market, permanently providing for high level of safety for its clients. Within the whole period of its functioning, the Company has been accumulating and exploiting all real-life experience available to maintain leadership in the sphere of its competence. As a result, the Company is able to solve any of your problems in a good and workmanlike manner. сompetent legal support, which enables to solve the most complicated security problems exclusively in the legal framework. Highly qualified personnel is our core value. Our Company appreciates it and tries to preserve in Kyiv as well as throughout Ukraine. The guards of the Security Company “SOKOL” can operate in complex non-routine situations and take coordinated decisions as well as provide for their timely and instant execution. Our personnel treat their responsibility in a highly professional way – should the need arise, you will be offered such a variant of your problem solution, which will meet all your requirements, being within the legal framework at that. All our guards are 100% fixed up with the most up-to-date special munition, uniform and transport means to meet any challenge. In the process of selection and training of our personnel we pay special attention to psychological preparation. It allows us to create an integrated, efficient and highly-professional crew, which appreciates and prevents the development of different kinds of potential threats. While functioning, our Company adheres to the list of the principles which, when you evaluate them, will surely make you our clients and friends. Custom-tailored approach to each client. Our employees deeply examine a situation before they offer or implement any solution. We do our best to fully satisfy the needs of every client. 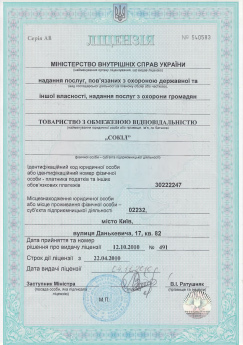 Standardization of activity and quality of services, offered throughout Ukraine, which the Company in Kyiv guarantees due to the usage of the most advanced and proven technologies and the professional skills of the empoyees. We enjoy more than a 22-year-old experience of successful activity in the security services market of Ukraine. The acquired field-oriented skills are of great value, they have been efficiently integrated and implemented in our everyday activity. The price policy of our Company is rather flexible and fully depend upon the problem at hand. Here you will never pay for things, which are of no importance for you. 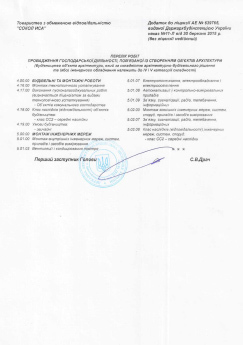 Many security companies in Kyiv claim about strong links with law-enforcement agencies. But only with us, due to the history of our activity, you can be absolutely sure of it. 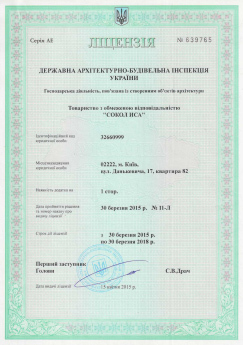 The Security Company “SOKOL” has all necessary authorization documents and licenses together with the professional legal service. It means that in our Company you can get maximum of the services, offered in the market. We warrant absolute confidentiality and protection of our clients personal information. Long-term experience and the most advanced technologies will make our cooperation pleasant and mutually profitable.